Take control of your digital life from anywhere with the OX App Suite centralized cloud environment. OX App Suite is a highly scalable platform that comes with groupware, collaboration & cloud-based apps, using responsive design techniques. The OX App Suite centralized cloud environment lets users manage their digital lives from a single interface, anywhere on any device. A highly scalable platform that delivers a wide range of cloud based services. It comes with groupware, collaboration & cloud-based apps, using responsive design techniques. Applications like cloud storage, document editing, email, tasks, calendar and much more. This means you no longer have to build all your own applications or work with other vendors that often erode your revenue. OX App Suite is a key part of your customer engagement strategy. One platform to enhance your offering, drive ARPU and make your customers love your brand. Resell OX App Suite and offer a fully hosted and managed platform to your customers. LuxCloud is a preferred partner of Open-Xchange, offering a one-stop shop for white label cloud business applications. More info. Personal, user-friendly centralized digital hub. Fully configurable, brandable and customizable, with Social Media integration. One-click data mining. Simply click on a contact and get an overview of all your correspondence, meetings, contact details and social network info. Increase the lifetime value and long term relationship for your customers. Access all your favourite online applications anytime with one login. Runs on any device (PC, tablet, smartphone, etc.) by default with no synchronization necessary. The Open-Xchange Product Sheet provides information about product benefits, Open-Xchange features and target market information. More info about the centralized cloud environment that lets your users manage their digital lives on any device. OX Text is a text editor which enables web-based, collaborative word processing, by letting users join forces to edit documents in real time. Uniquely OX Text provides a seamless document Round-trip. It is compatible with MS Office and OpenOffice. Find out more of the advantages of OX Text. With OX Drive you can upload, download and synchronize documents across multiple devices and operating systems. It paves the way for easy to use, consistent file management. What is the difference between OX Webmail and OX App Suite? How do I set up OX users in Gateway4Cloud? Check out this tutorial video about how to set up OX users in Gateway4Cloud or go to our Tutorials & Instructions page. 3. Make sure “My outgoing server (SMTP) requires authentication” option is selected. 5. Click on OK, then Next. 6. Close the pop-up window and click on Finish. NOTE: This configuration is for OXaaS product. If you use the normal Open-Xchange, please check the configuration settings here. 2. Click on More Settings and go to Outgoing Server tab. What is the difference between OXaaS and OX App Suite (hosted by LuxCloud)? OXaaS (Open-Xchange-as-a-Service) is hosted by OX in Germany. The platform is maintained and updated by Open-Xchange and receives the latest new features as soon as they become available. The platform has a higher uptime guarantee and is used by several big Telecom operators in Europe. This solution is compliant to German and European data protection laws. OX App Suite (hosted by LuxCloud) is hosted in Luxembourg and maintained and updated by LuxCloud. This solution is compliant to Luxembourgian and European data protection laws and has a limited feature set available compared to the OXaaS platform. 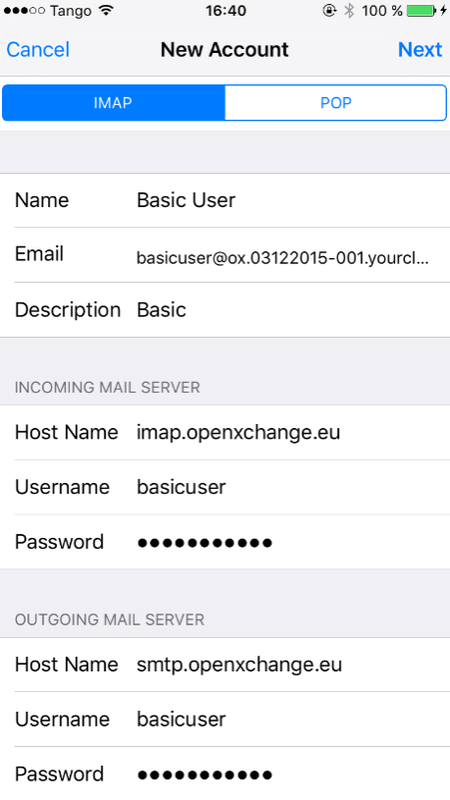 What is the URL to the webmail for OX-as-a-Service (OXaaS)? For externally hosted domains what do I need to configure as MX records?